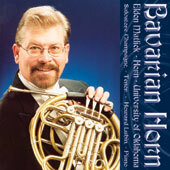 4262-MCD BAVARIAN HORN ELDON MATLICK, FRENCH HORN - SALVATORE CHAMPAGNE, TENOR HOWARD LUBIN, PIANO... This is the favorite Horn CD of Mark. Superb tone. Oustanding musicianship. Literature that speaks to the soul. A recording that is deserving of Grammy recognition. This is the finest horn CD ever made! Do not pass this up!!!... Sonata for Horn and Piano, Op. 29 (Mvts. Allegro maestoso; Larghetto e tranquillo; Allegro vivace e con spirito)/J. Haas - Auf dem Strom, Op. Post. 119, D 943/F. Schubert - Impressions in Jazz for Horn and Piano, Op. 32 (Mvts. Harlequin; Once Upon a Time; Rapids)/M. Rindt - Notturno for Horn and Piano, Op. 112/C. Reinecke - Sonatina for Horn and Piano, Op. 75a. (Mvts. Maestoso; Ballade; Finale. Presto)/B. Hummel... This CD received placement on the 2003 Grammy Entry List for Best Solo Performance without Orchestra.